Matthew Bannister speaks to Guillaume Denoix de Saint-Marc who lost his father when UTA Flight 772 was blown up over the Sahara, he talks about building a memorial to the victims. On 19 September 1989 UTA Flight 772 was blown up over the Sahara Desert, killing all 170 people on board. 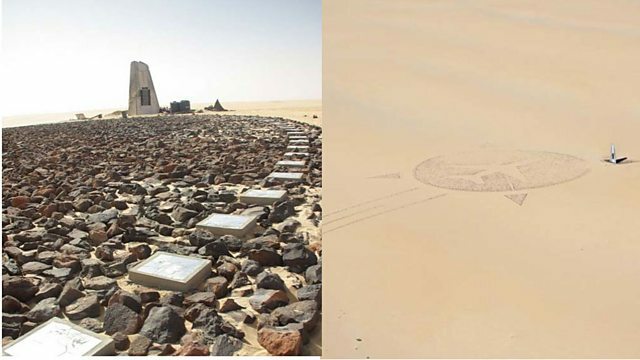 Guillaume Denoix de Saint-Marc, whose father was killed on the plane, designed and built a memorial to the victims at the crash site in the Niger desert. Made up of dark stones in a circle with one broken mirror for each person killed, it can be seen from high above the Earth. Mini and Me: Michael 'Mini' Cooper was the subject of an award-winning documentary by the film-maker Franc Roddam. They tell Matthew about their 38 year friendship and Mini's time spent in care and prison. What is it like to discover your father is a CIA spy? Foreign correspondent Scott Johnson explores his CIA childhood in his memoir The Wolf and the Watchman. Also on the programme: Agnieszka Fryckowska is Base Commander at the newly rebuilt Halley 6 base station in the Antarctic and has just spent two months in total darkness.